Got a spare minute? Interested in employment and skills? You’ve come to the right place! This is our One Minute Monday, where we outline a fact from our research in under 60 seconds. The proportion of the UK’s working population without any qualifications has been consistently falling for the last decade. Between 2003 and 2013 the percentage of UK 19 to 64 years olds with no qualification has fallen 6.4%, from 15.3% to 8.9%. A plurality of the working population has been qualified at levels 4-6 since 2002; these higher level qualifications range from a certificate of higher education to a bachelor’s degree. These trends are predicted to continue to 2020, when the percentage of a population without qualifications will be an even lower 5.4%. 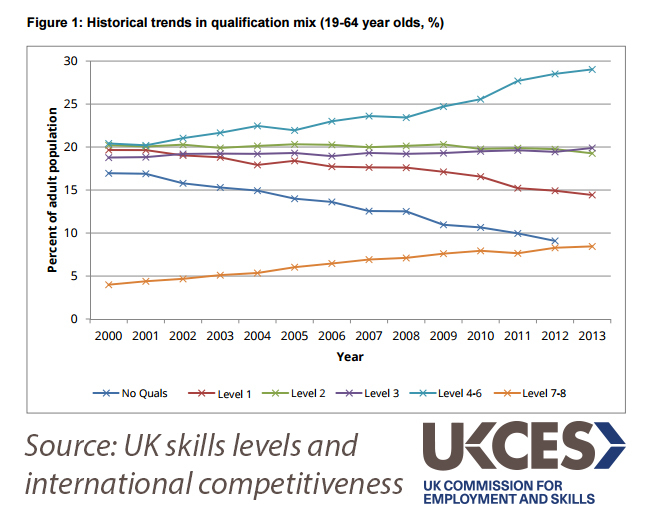 Our full report on UK skills and international competitiveness gives much more detail on this trend and how the UK compares to other OECD countries. If you’re in a rush, see our previous One Minute Monday on how UK’s skills levels compare to other countries’. If you want to know more about skills levels or have questions about this stat, tweet us @ukces or leave a comment below.